Our product range consists of fire detection, alarm display systems, public address & voice alarm, sensors & modules, aspiration systems, video surveillance, access control technologies, intrusion alarms & home automation systems among others. We have a strong presence in APAC, where we have state-of-the art manufacturing facilities and Engineering Centers of Excellence in China and India to develop best-in-class products and solutions for global markets. We have also established training centers to cultivate the right talent and skill-sets in APAC, to enable quality installation and world-class after sales service and maintenance for our customers. Safety has emerged as a top priority for our customers, and Honeywell is dedicated to helping companies develop an enduring culture of safety, particularly in process-oriented industries. We provide state-of-the-art safety systems and services that protect the lives of workers, the profitability of your business, the environment, and local communities. As part of a Fortune 100 company, Honeywell Inc. is both a pioneer and a global player with an unrelenting focus on quality, technology, and safety. 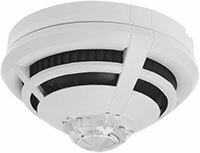 Fire detection systems that can adapt to the challenges of the future have to fulfill a wealth of complex requirements, including precise configuration, expansion to meet new demands, flexibility in adding new functions and components and backward compatibility. They should also feature good looks, ease of use and low life cycle and maintenance costs. FlexES gives you more freedom in planning, autonomy in budgeting and flexibility in operation. 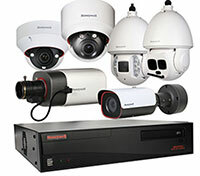 Honeywell's equIP Camera Series is the ideal solution for customers with high security needs that require a reliable solution, with less downtime, and lower maintenance cost. Superb video quality even in the most challenging lighting conditions, it offers wide coverage and is easy to install and integrate with third party platforms. Honeywell HEIPTZ-2201W-IR is an IP explosion-proof PTZ camera featuring superior 1080P high definition image quality, Wide Dynamic Range (WDR), True Day/Night (TDN), a built-in IR illuminator, and ATEX certified construction. 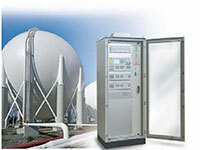 This advanced IP camera is designed for installation in potentially explosive atmospheres, such as petrochemical fields, oil refineries, LNG facilities and so forth. 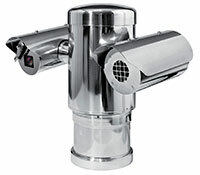 The HEIPTZ-2201W-IR delivers high definition images of 1080P (1920 x 1080) resolution at up to 30 frames per second. Its 360° continuous rotation and 20x zoom lens deliver a full picture of the area under surveillance in optimal width and depth. With 80-meter IR distance, the IR illuminator of the HEIPTZ-2201W-IR is assembled for providing clear images for surveillance in dim environments and at complete darkness. Also featuring WDR and TDN, the HEIPTZ- 2201W-IR is capable to adapt to various lighting conditions which guarantees superior image quality any time. The HUS-XPRO is an all-inclusive enterprise IP solution management server developed by Honeywell. IP Surveillance System is an essential component for enterprises to perform professional security monitoring and recording to protect their properties. Using IP network for data transmission eliminates the need of proprietary boxes resulting in cost reduction in system deployment and management. Honeywell IP Surveillance Solution allows local and remote control on any surveillance monitoring sites – from mid-range applications with several hundreds of cameras, to even the large scale ones equipped with more than ten thousand. Designed to escalate surveillance mobility and flexibility, video data can be shared and transferred to different sites. To extend a complete IP-based and centralized security system, the HUS-XPRO can be integrated with various Honeywell security products including high definition IP cameras, network video recorder HUS-NVR-5100A-E and HUS-NVR-7200A-E for large-scale applications, and HUS-NVR-1032-E and HD-NVR-108/116 for mid-scale architecture. To deploy an hybrid solution, simply apply the HUS-XPRO together with DVRs HD-16DVR-D or HVR-9000, and HVAE-0100/0400, HUSS-E4V or HUSS-E2X/E4X/E8X encoders. 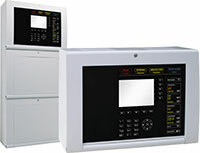 IP SAN unified storage system is also available. As an integrated solution, the HUS-XPRO can be integrated with not only video products, but also the reputable access control systems Pro-Watch® and WIN-PAK®, as well as intrusion system VISTA. Increased sensitivity with flair detection technology. Future proof expandability with VESDA Flex. 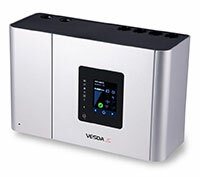 VESDA Connect provides flexible networking and programming capabilities.